Human powered displacement boats should be long and narrow for maximum efficiency. However, when you try to paddle one of these boats in surf or breaking waves, they tend to shoot over the top of the wave. The stern stays in the water and the bow heads out into thin air, that is, until the boat's center of gravity moves past the crest of the wave. At that point, the bow feels gravity and comes crashing down. 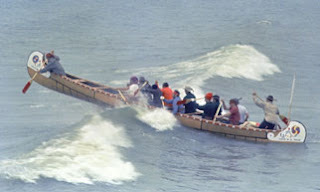 This is a photo of one of Ralph Frese's replica fur trade canoes out on Lake Michigan when some swell was running from the north. The canoe isn't quite up to its center of gravity, so the guy in the bow has a ways to go yet before he comes crashing down. Ralph told me that when the canoe did come crashing down it shot water twenty feet up in the air, but not a drop got into the canoe. Here is a similar situation with an Indian boat in the Kerela region. 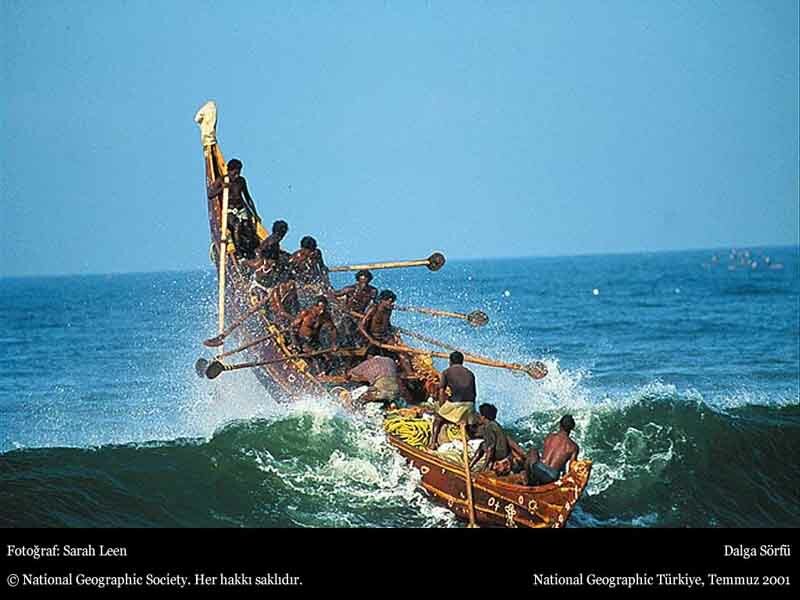 But scary as it looks to paddle a long skinny boat into breaking waves, paddling them down a breaking wave is even more scary since a long boat will try to broach if the wave is moving faster than the boat.